The Buddha once said: “Those who see dharma, see me. Those who see me, see dharma. Truly seeing dharma, one sees me. 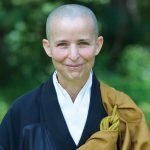 seeing me, one truly sees dharma.” In this talk, Hojin Sensei tells the story of the life of the Buddha as a model of dharma practice, and discusses how we can see the Buddha’s life in our own.